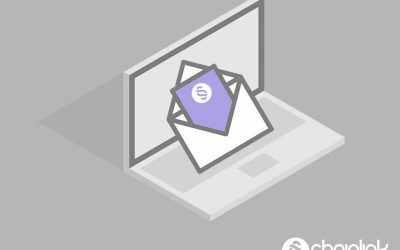 A new product means a new opportunity for your email recipients to take action and purchase your new product, service, feature, etc. The more seamless the transition to your store (and the check-out page) the more you’ll be able to sell this new addition to your offerings. The straightforward nature of this new product announcement is clean and effective. Sometimes all subscribers need is an email and has one main message and limited distractions. This way, the email has a better chance of leaving an impact. The invitation to “View All Products” and drive users directly to your website expedites the process of driving users directly to your site. Ultimately you want to get people to your website so they can check out (and hopefully purchase) your new product. This example shows that sometimes promotional emails don’t need to be loud and fancy if that doesn’t jive with your brand. By knowing their audience well, Acustom Apparel matches the tone of the promotion with the laid-back yet sophisticated style of their customers. It’s a small victory that you have subscribers who signed up for blog updates to begin with. Make it fun and interactive (as long as it doesn’t contradict your brand’s voice). Requesting feedback or asking subscribers to try your product/service is the easy part. This round up of new blog posts balances design with functionality. This email makes it easy to quickly scroll through and make the blog posts accessible. 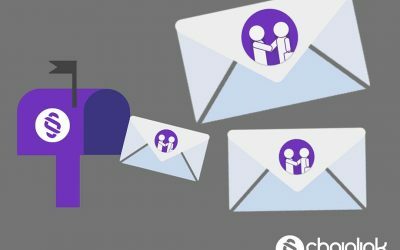 The design of this email is effective with on-brand design and graphics that don’t distract from the overall goal of getting subscribers to view the latest blog post. Saying thank you is always a great way to get people’s attention and win their favor. 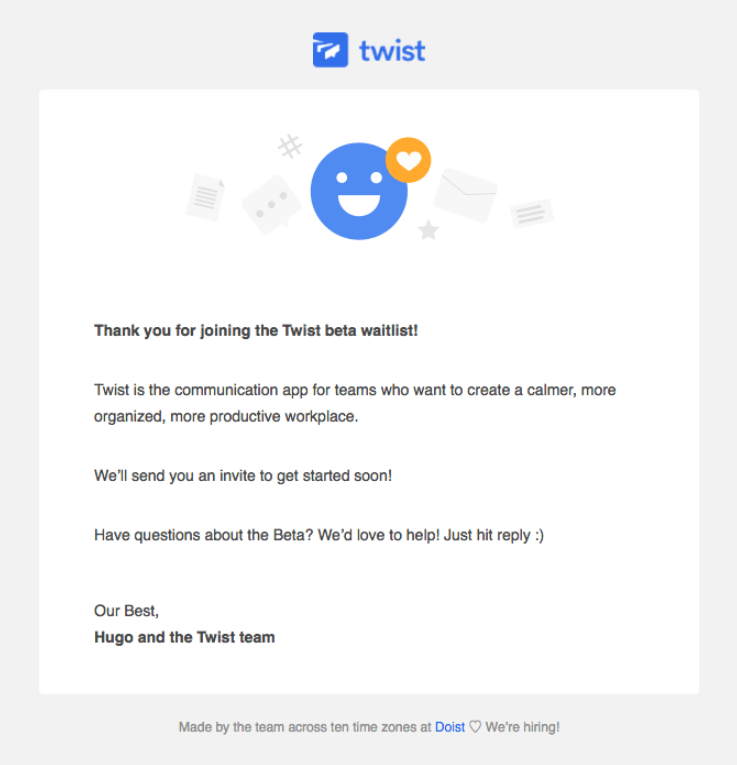 These thank you emails are great examples of doing just that in a marketing-savvy way. 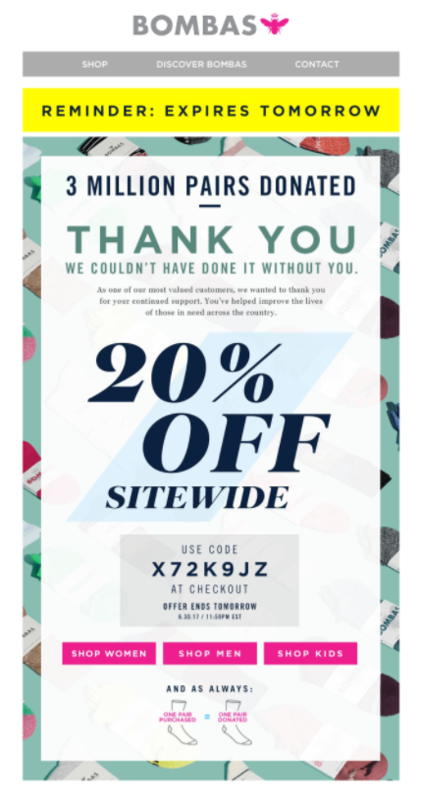 A reminder, an impressive milestone, and a discount are great additions to a thank you email that make a significant difference in catching attention. 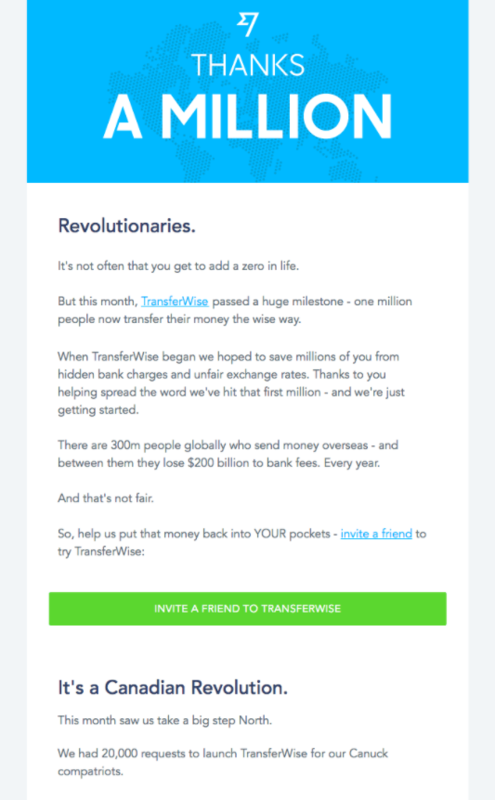 TransferWise also thanks customers for allowing them to reach an important milestone and does so with a fun play on words. Ever thought about combining thank you with congratulations? 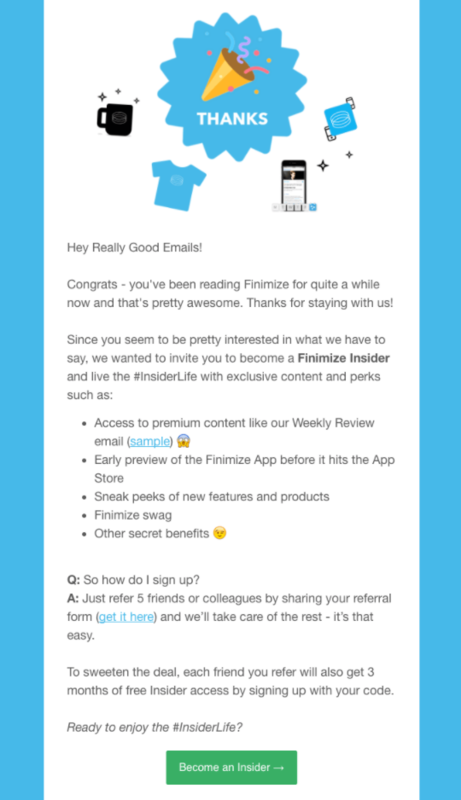 Being Finimize’s customer is a cause for celebration according to them. Take a hint from the company and make your thank you’s a little more fun. 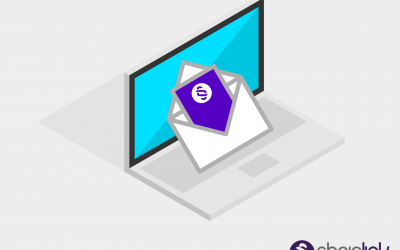 When you let people know they successfully signed up, you don’t want to send a thoughtless email that makes them regret signing up. Twist keeps it short and sweet, which is exactly what most subscribers want. The minimal text and offer for assistance leaves no uncertainty or redundancy. The block format of this confirmation email is exactly what the subscriber wants to see. This design leaves no question about what your next step is. You can either confirm your email on the spot or inquire further about the product. 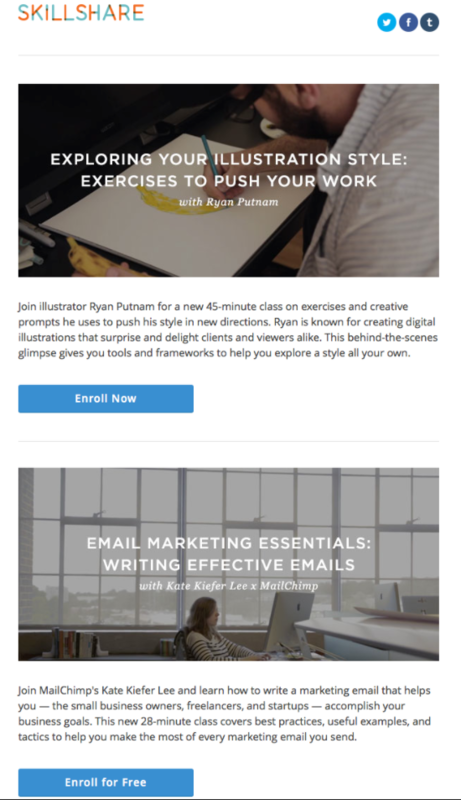 Skillshare’s choice of embedding a video into its email is interesting and unusual. Nevertheless, the “Start Watching” button whisks users away to landing page where they can start the course(s) they signed up for. 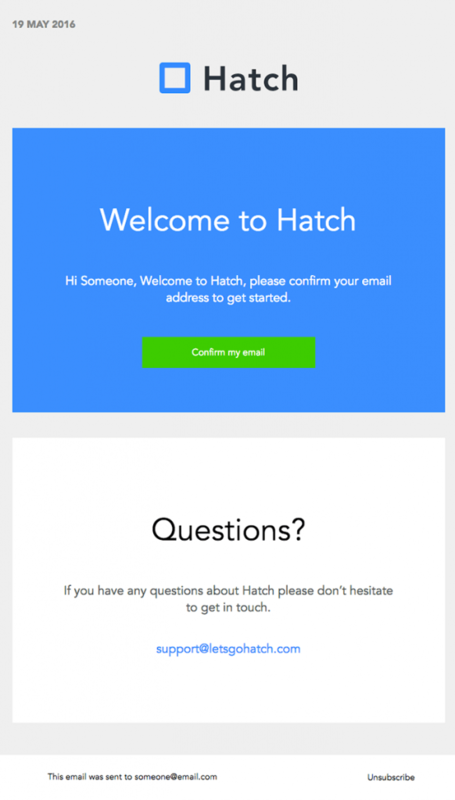 I like this sign up email because it’s memorable and encourages users to get started right away. This example deserves attention because it contains the absolute bare minimum of information and yet succeeds. The black and white vintage quality of the background is a refreshing change from the technicolor emails competing for attention in people’s inbox. 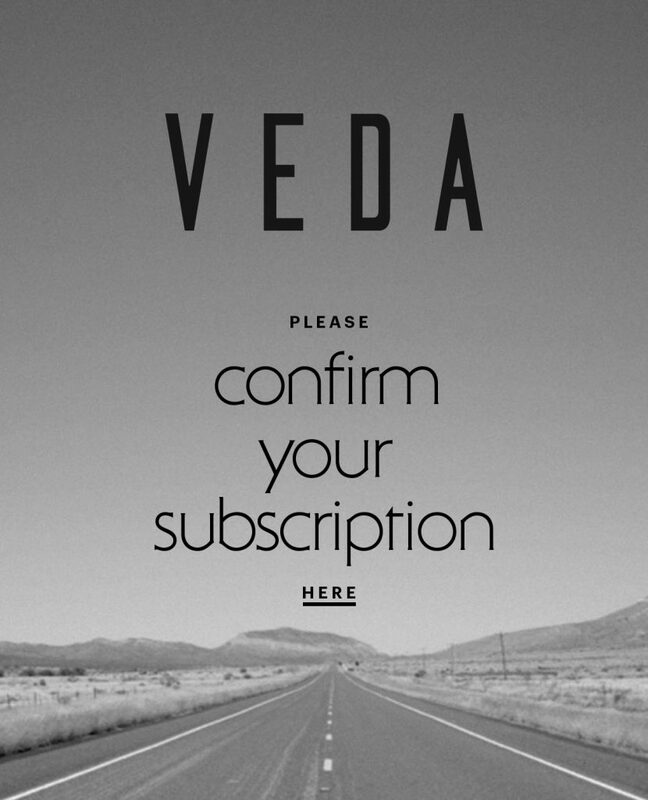 Veda was definitely onto something. 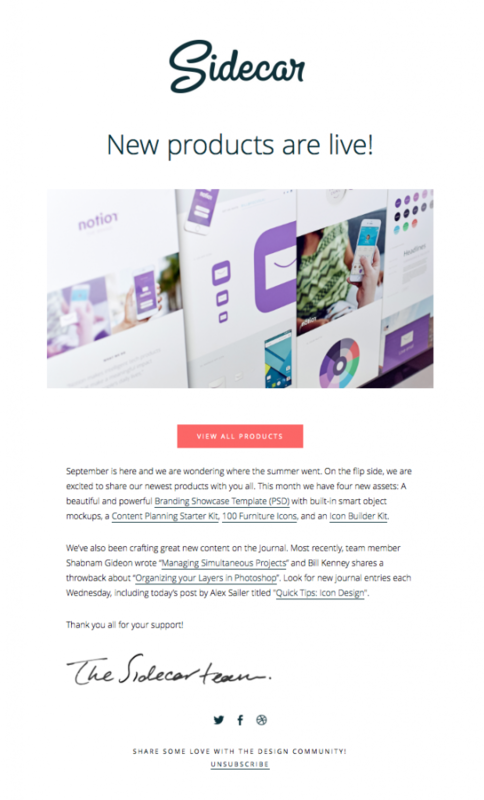 Newsletter emails are very similar to new blog post announcement emails. Their primary focus should always be the new content being shared. 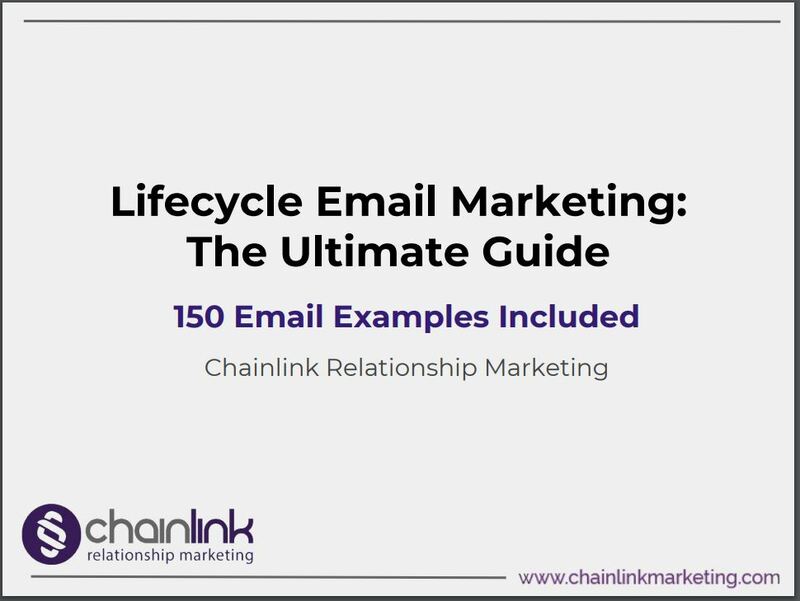 Since newsletter emails frequently include multiple pieces of curated content, the layout and overall presentation are extremely important. 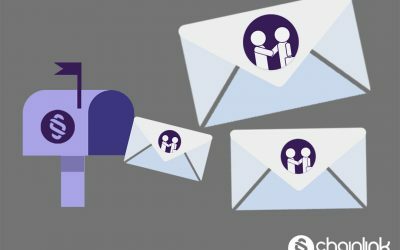 Check out our blog post about ways to boost your number of newsletter subscribers, too. 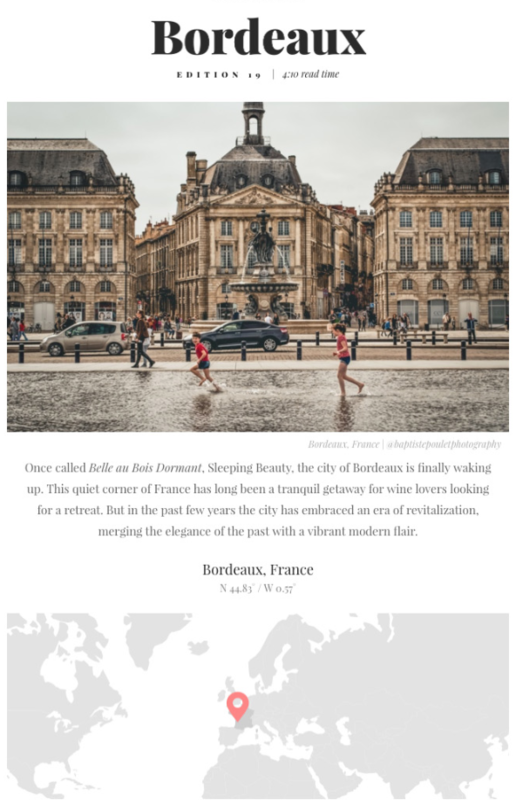 This perfectly organized travel newsletter provides plenty of content in the body of the email itself, while also driving subscribers to the different events’ landing pages. The way this email directs you to click on their social media icons is seamless as well. 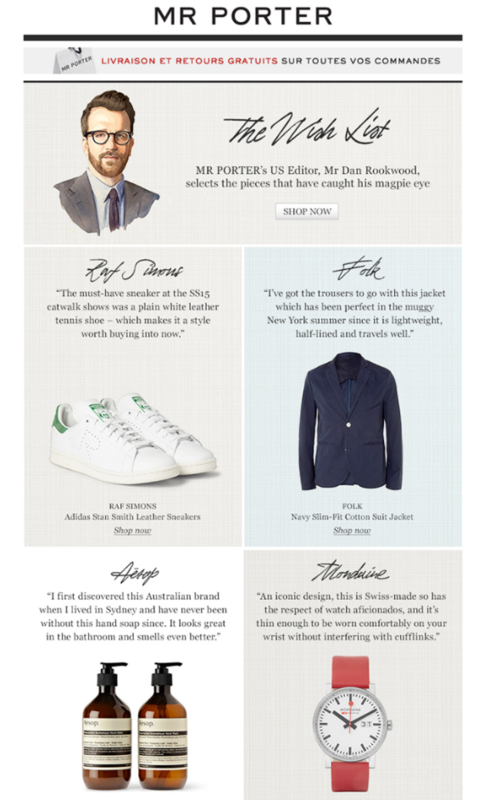 InterfaceLovers proves that quality beats quantity when it comes to the content of a newsletter. This example masters the art of not overwhelming subscribers with too much going on in the body of the email. The two featured interviews are displayed in an enticing way, and the head shots of the interviewees are perfect. 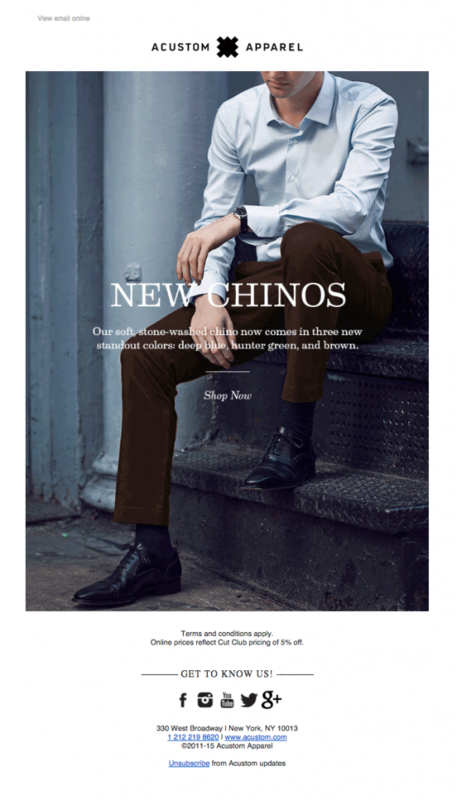 This text-heavy newsletter works because it delivers exactly what the audience wants. 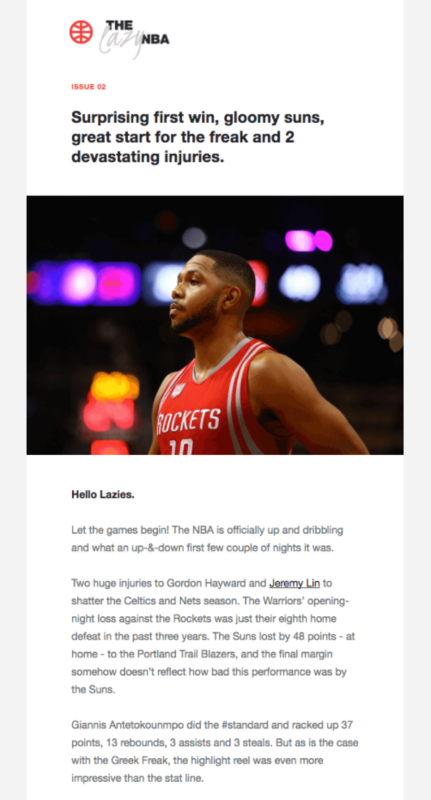 Like most sports writing, the newsletter reads as more of a spoken narration. 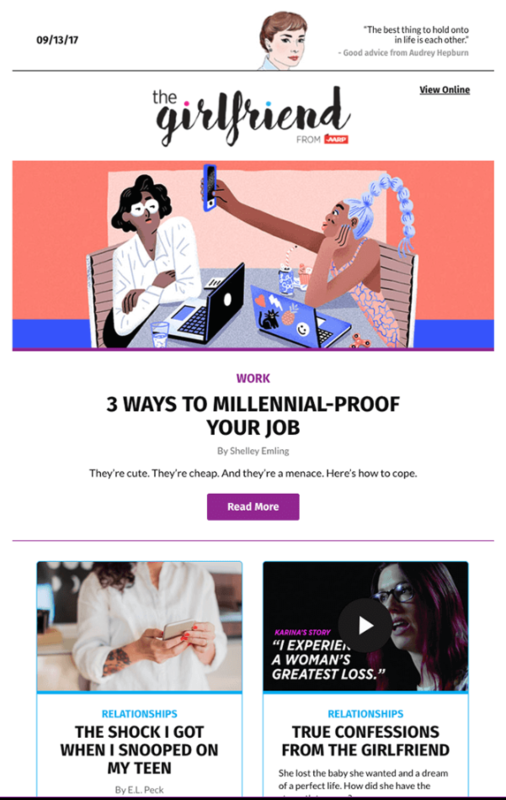 The user-friendly email format with catchy teasers of each article make this newsletter a success. You can tell by the snippets that this content is something Girlfriend’s target audience looks forward to reading. 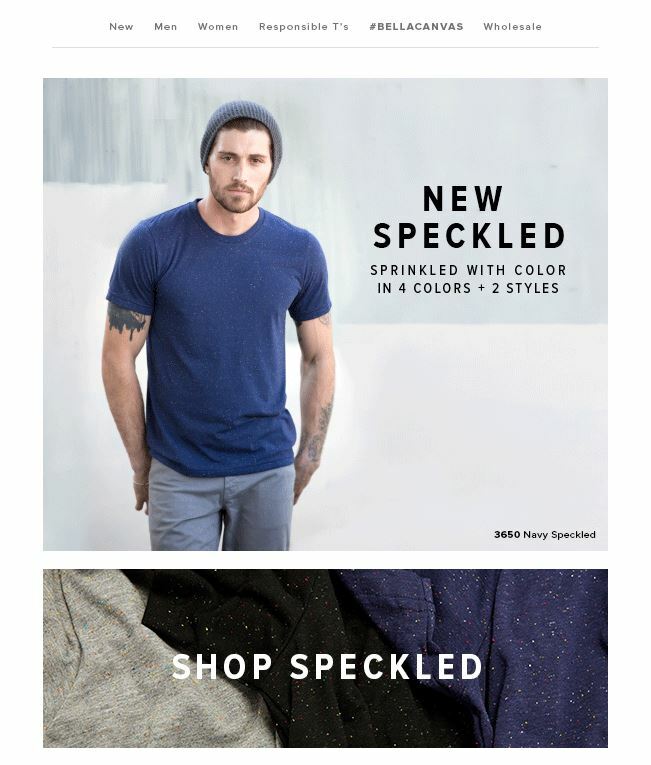 The best part about this email is its unique stylistic quality that emphasizes the artisanal nature of this curator. This email does a great job of endorsing products with a subtle dose of persuasion. Another email subcategory in the family of newsletter emails are roundup emails. The difference is that the company/brand did not create the content they’re rounding up. These lists can be trickier to curate than they seem, but when done well they can bring enormous value to subscribers. What’s nice about this newsletter is that the recommendations for kid-friendly, family-oriented places to vacation around the US offers variety that most newsletters wouldn’t. Take note that the content is solid but the design isn’t revolutionary: it doesn’t have to be when the content speaks for itself. Pinterest is one of the great kings of curated content. Pinterest’s round ups are algorithm based but nevertheless formatted in the ideal way for users. Their trick is to make the content in the round-up as personalized as possible to the user to drive them back to Pinterest’s platform to find more of what they love/what they were looking for. The use of white space in his email is genius. It draws the eye naturally where it should be: to the CTA’s. Some round-up emails don’t need copy to clutter them up. These photos speak for themselves and fit perfectly in a simple template. The amount of online learning material available today is straight-up overwhelming. That’s why it’s unsurprising that course-related emails are so great in length. Give people what they signed up for: and give them plenty of it. 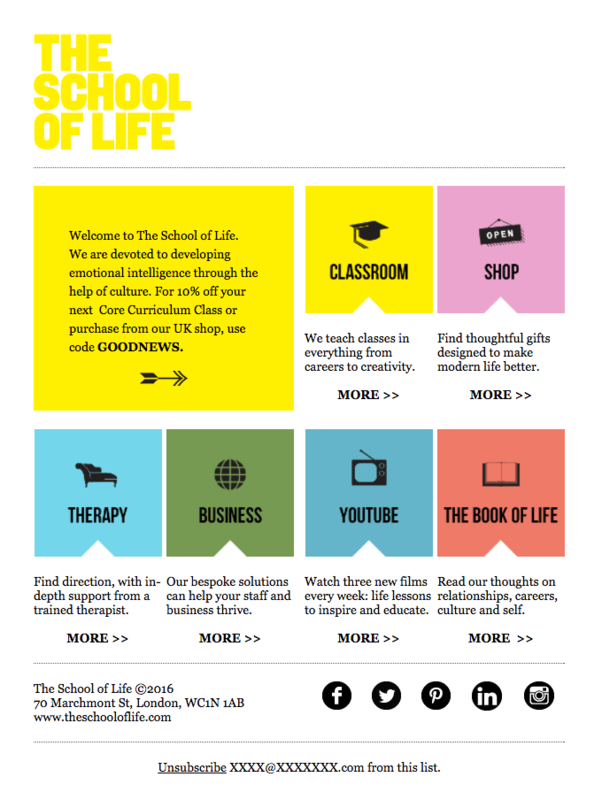 The School of Life welcome email is straightforward and to the point. Effective and efficient. This promotional email for the course is awesome. It doesn’t push its case but it emphasizes what’s important. Course emails that provide updates on progress are great. They encourage subscribers to take pride in their student status and continue to work towards their goals.